We are generation anxiety when it comes to feeding our children. What a responsibility to get it right. It starts from birth through to weaning and slowly escalates through childhood. Breast or bottle? Baby led weaning or purees? Are they allowed sweets? Clearing plates? What if my child is fussy? School lunch boxes are policed by dinner ladies and the responsibility as a parent can be huge to ensure we are promoting health; not encouraging obesity and not setting them up for an eating disorder. Then, if your own relationship with food is complicated, this food fear is exacerbated as you naturally want to set the fine example for your children so you don’t repeat history. What a responsibility it is. Of course, we are all influenced powerfully by our own upbringing. Many of you might have adverse reactions or thoughts to specific foods because of early experiences. To this day, I do not like baked beans or mashed potato due to early school dinner nightmares! I shudder at the thought. 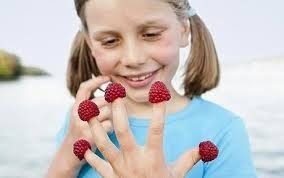 So what can you do to help to increase your chances of your children feeling better about food? 1. Encourage your children to listen to their hunger; to listen to their bodies. If they are asking for more, rather than you making the judgement, ask them how they feel? Does your tummy feel full? Are you still hungry? 2. As much as possible, set the example with good eating habits. Don’t diet. If you feel you must, don’t talk about it or make an issue of it. This counts also for body image. Look in the mirror and smile and set the example for feeling at peace with your body. 3. If your child is overweight; please don’t put them on a diet. This so often can lead to eating problems later on. Encourage healthier food choices and being active. If they are using food as comfort, talk to them. Help them expand their emotional world. 4. Let children have choice about what they eat. Enlist their help in preparation, cooking and shopping. If children feel valued in making their own food decisions, they are more likely to eat a range of foods and this sets them up for good habits in trusting and valuing their bodies for later on. 5. Don’t label foods as ‘good’ and ‘bad’. This leads to guilt, shame and sometimes secret eating. You can still promote healthy eating and nutritious food choices, without labelling foods. It is a challenge to get the balance right. Be kind to yourself. Do your best. You cannot do more. You are only one influence of many to your child. Exemplary parenting around food does still not guarantee the perfect outcome. Please do email me if you have any comments.